Olympus Australia announces a new range of analytical equipment suitable for the recycling industry. Recently showcased at the Australian Waste and Recycling Exhibition (AWRE) held in Melbourne, Olympus’ adaptable, lightweight analysis instrumentation for the recycling industry includes new X-ray fluorescence (XRF) analysers. According to Andrew Taylor, Regional Sales Manager with Olympus, the Delta Professional has been developed specifically for the alloy and NDT sectors, especially for companies conducting analysis of manufactured and scrap materials such as stainless steel and a wide range of alloy types. Olympus also displayed the GoldXpert, a stylish and functional benchtop precious metals analyser ideal for the new and second-hand precious metals market. Its compact and attractive design is ideal for use on a showroom floor. Taylor explains that the GoldXpert can take the drudgery out of routine analysis, is easy to use and provides carat and compositional analysis results with one push of a button. 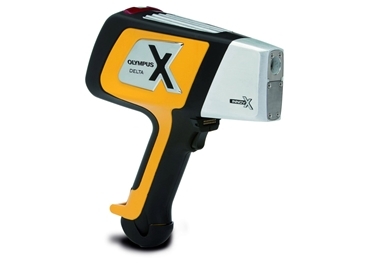 Technological advances have enabled Olympus to design and build lighter and more compact XRF analysers that are now more affordable for smaller companies. The largest market in Australia for XRF analysers has been the mining and mineral exploration sector where they are used for grading ore, exploration, metallurgy and mine site remediation and closure. In addition to employing these analysers in markets such as scrap metal recycling, the technology could also be used by environmental consultancies specialising in contaminated land remediation. Overseas scrap metal companies, especially in Asia and the US use XRF analysers extensively; however, in Australia a lot of companies are yet to discover the benefits of the technology. A business division of Olympus Corporation, Olympus IMS builds and markets leading edge testing systems including ultrasonic flaw detectors and thickness gauges, videoscopes, borescopes, microscopes, high speed video cameras, in-line and advanced non-destructive testing systems, X-Ray fluorescence analysers, interferometers, and a large selection of industrial scanners, probes, software programs, and instrument accessories.